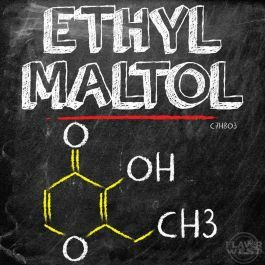 Ethyl Maltol is a sweet aromatic flavor that combines well with fruits or desserts. Widely used as a unique sweetener flavoring for food, drink, beverage, tobacco and more. Type: Ethyl Maltol Powder. Ingredients: 100% Pure UPS Kosher Grade Ethyl Maltol Powder. Usage Rate: 10% for E-use. Flavor Suitability: Drinks, beverages, ice cream, sandwich, candies, baking treats and more. No Refunds on Flavoring.